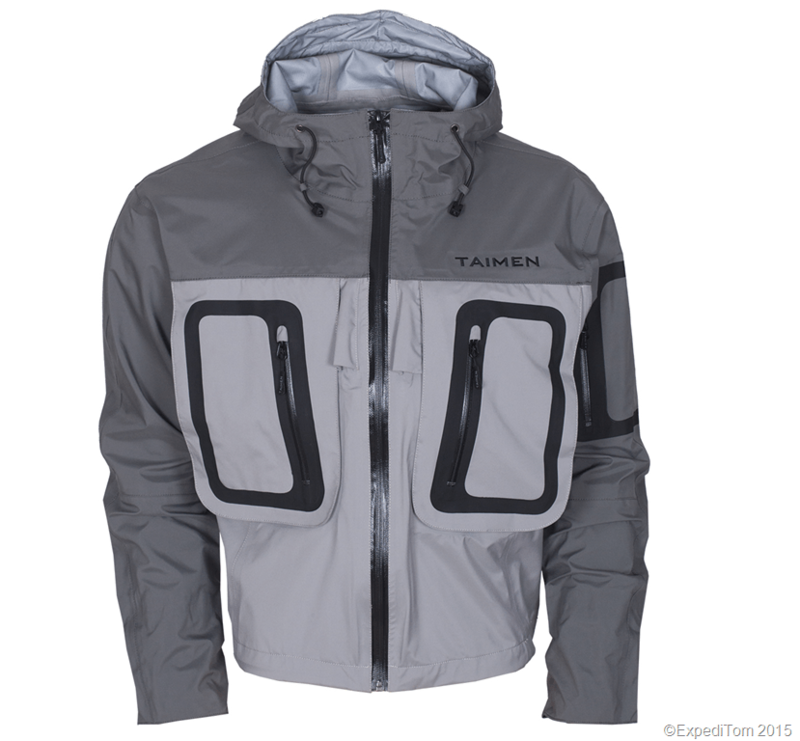 Taimen Master Wading Jacket – you see, or actually you do not see the 2 missing cords to adjust hoodie where there are only two elastic bands. 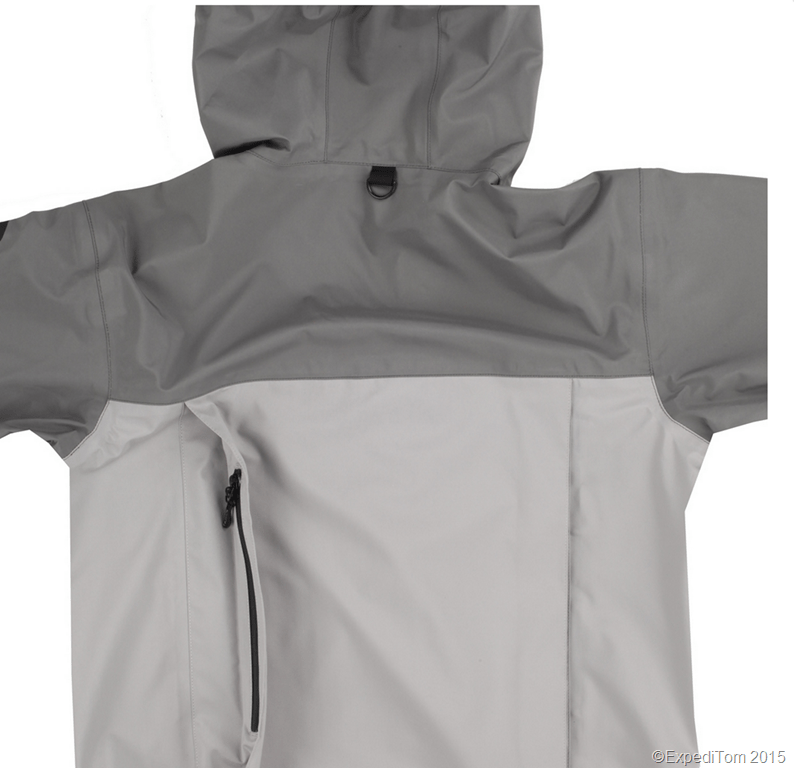 The Taimen Master Wading Jacket is made out of 3-layer of no-name fabric which is waterproof and at the same time breathable. Taimen declares that the jacket is waterproof up to 10’000mm. All seams are sealed with tape. Having 4 front, 1 large back and 1 waterproof inner pocket, the jacket offers plenty of space for fly boxes, food and other stuff. Additionally, the jacket has two hand pockets on chest level to warm them. The jacket also comes with 2 built-in retractor, which allows you to attach a clipper, an amadou or whatever. The hood is equipped with a bendable piece of metal. Thus, you can put it in the shape you want. All zippers have a small piece of string attached with the logo of Taimen on a plastic thing. In addition, there are cords around the waist and in the hood. At the cuffs there are velcro tightener to avoid water entering to the wrist. Heaps of pockets and ‘waterproof’ cuffs to tighten. Rabbit pocket on the back for food/beverage as well as a D-ring which was not properly attached. Even though you can read some bad reviews about the service of Taimen (and here) in the world wide web, the price convinced me to give it a try. The sizes of the jacket are well measured in the file provided by Taimen and are in my case correct. The waterproofness was at the beginning impressive and it just dripped off, but it lost some of this ability during the time. It does not mean it is not waterproof anymore, but the rain did not pearl off as at the beginning. Rather the jacket begins to soak it up as you can see in the picture below. Maybe I have to impregnate it again. Addition after 2 years of usage: I impregnated the rain jacket and it improved its waterproofness drastically. 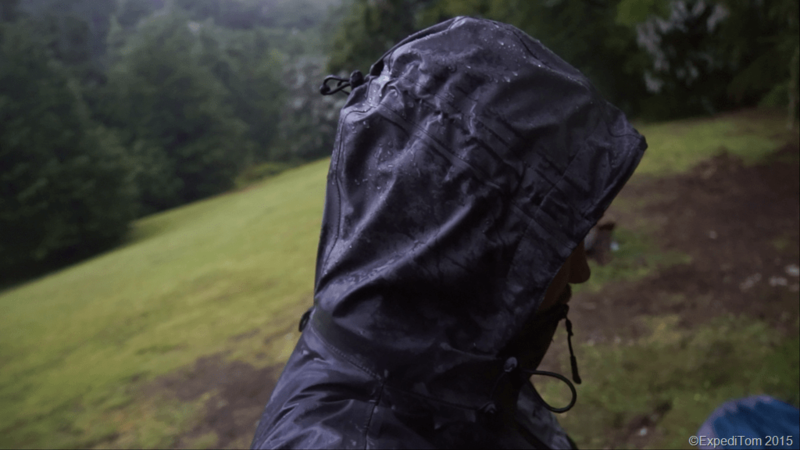 According to a salesman at the Transa outdoor store every rainjacket must be impregnated after some time. Waterproofness after one year. It soaks more than at the beginning. However, there were certain things I have to mention which weren’t that good. First of all several grips of the zippers broke off and I wrote this to Taimen who sent me with the next order some new ones. The second thing that wasn’t right was the D-ring at the back, which holds the net. The D-ring wasn’t properly attached and thus it was crooked and looked rather to the right than down as it is supposed to be. I fixed this by sowing the D-ring neat to the fabric. The third issue I realised only recently that two cords to adjust the hood are missing. You see this even in the original picture of Taimen (picture one) where you see the two elastic band on both sides of the hood but neither of them has a cord to tighten it. This means it is not only a failure in one jacket but obviously a missing part in the production. Anyway, it was quite easy to fix by buying two cords in the supermarket. The fourth and last failure is as well the worst: The glued seams loosened. I admit that I used the jacket a lot during this year and in every weather you can imagine, but this shouldn’t happen after 1 year. It was between a front pocket and a zipper that the glue just disappeared and the rain unhindered entered the pocket. I glued this by myself, but my trust in the jacket was pretty reduced. 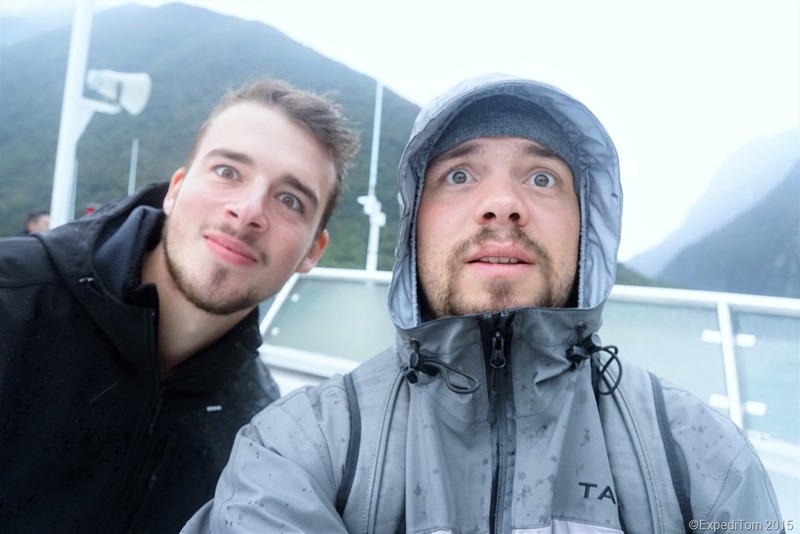 Useful outer shell to travel (Milford Sound, New Zealand) and you see the fixed cords. On the other side there were as well a lot good things about this jacket. I love the colour which camouflages very good in different environments. It has heaps of pockets so I do not need to carry an extra pack for small explorations. The jacket is a reliable waterproof outer shell to travel and can be worn as well when it is sunny without getting too hot. The breathability is present but not superior – you still sweat. The bendable piece of metal in the hood allows free sight even in windy conditions and the 2 built-in plastic retractors do their job very well. Even two years later. 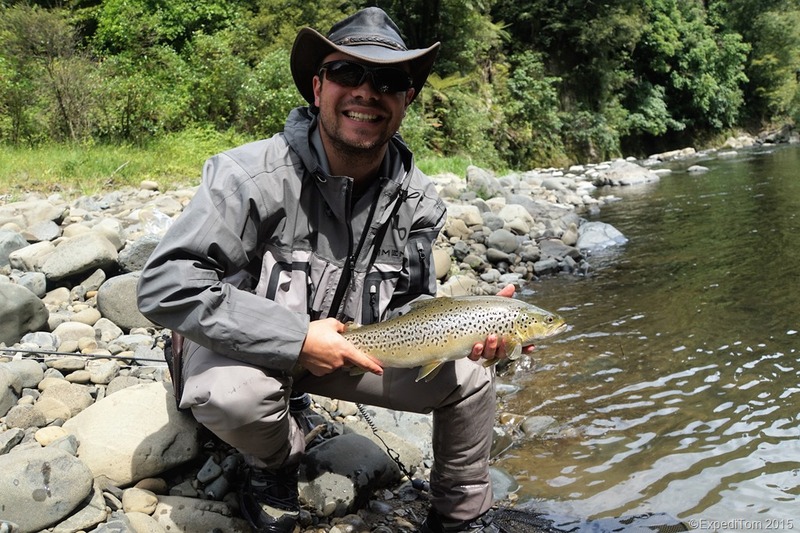 The smoke grey colour of the jacket and the Taimen waders is doing its job as camouflage very well or did you recognise me on the stone? Would I buy it again? Maybe. Mostly small issues, but I guess jackets from more notable brands such as Simms are more durable. Nonetheless, this can be good jacket for beginners who want to save a penny (EUR 145.- January 2016) and are willing to fix the issue mentioned above by do-it-yourself. 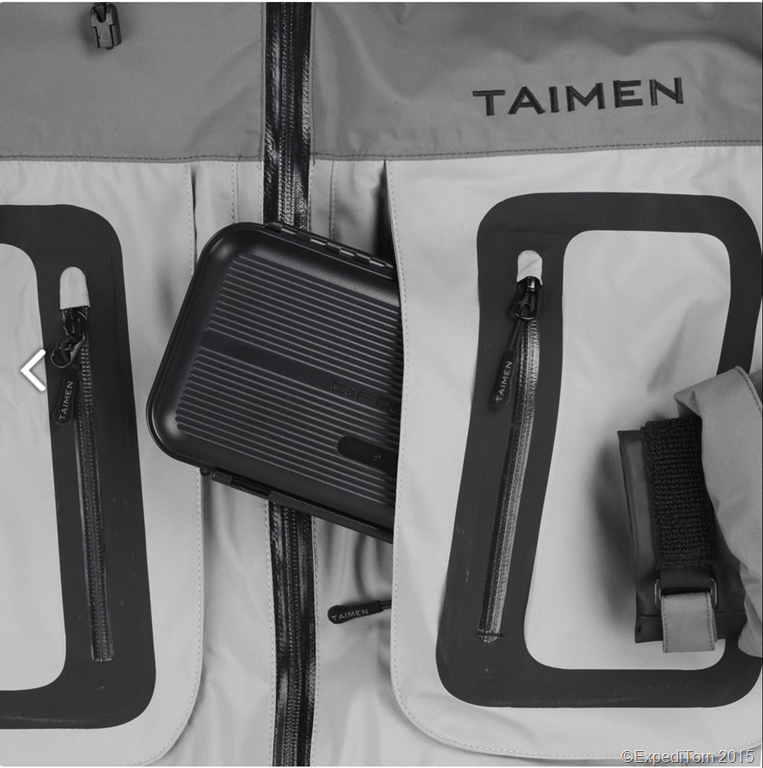 Although it seems that Taimen is at the moment just selling the remnants of their stock of this Wading Jacket, I think this review provides good information of what to expect if you buy from this brand in general. Nice to wear as well during sunshine, although the breathability isn’t as good as you don’t sweat. This article has no affiliate links and is only based on my opinion. What’s your opinion of the brand Taimen? Any experience?